We’re deep enough into the 21st Century that the cure to our modern day problems shouldn’t use 20th century thinking. Magnolia Ave. in North Hollywood is one of the Valley’s most underrated gems with a unique collection of stores, theaters and nightlife that complements this vertically growing neighborhood of NoHo. While the footprints of this walkable town known as Lankershim over a century ago still exist, auto-centric thinking has chipped away at the human element as cars became king. Lankershim Blvd. 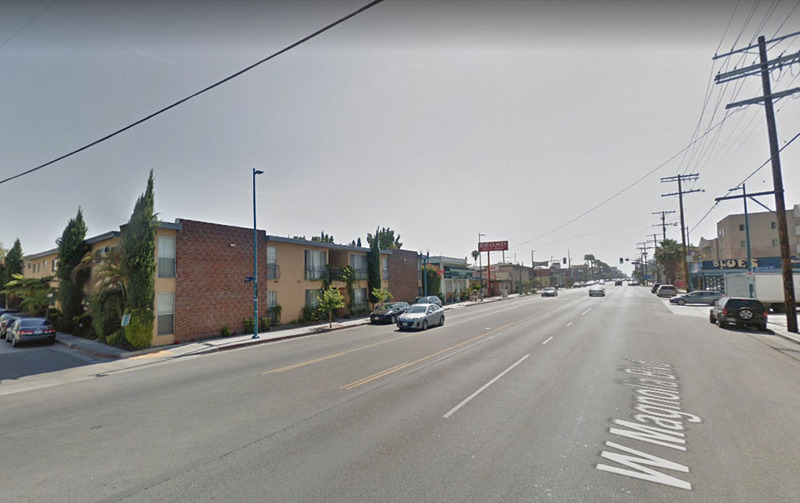 used to be a main attraction, but even with the addition of the parallel 170 Freeway sixty years ago, the need to transform this street to shuttle cars as many cars as possible through this neighborhood was deemed more urgent than serving the space itself. There has been some movement to turn the clock back in recent years with a new signal in front of the Television Academy and even a bike corral, but bigger improvements coming from the Great Streets project all seems but extinct. Magnolia is another vital cog in NoHo’s character, but this street has seen its livability diminish as well. Street widenings by the City of LA have been put into place piecemeal aiming to double the number of traffic lanes from one to two in each direction since the 1990s to increase vehicle capacity from the freeway to the Burbank border. Which version of Magnolia do you prefer? The work has been done intermittently and so far incomplete. At the moment, the second lane has been added for westbound travel from the freeway to the City’s border to the east, but eastbound only goes from the 170 to Lankershim. The Bureau of Engineering is looking to do more of the same between Vineland and Cahuenga trimming the sidewalk on the north side of the street after doing the south seven years earlier. Needless to say, the results of these previous “improvements” have been cringeworthy. Sidewalks have been narrowed so drastically that you question the legality of the work. Take a look at this sidewalk between Tujunga and Bakman. These are downright shameful conditions to have especially with an elementary school across the street and yes, there are some of the same awkward design issues on the other side. 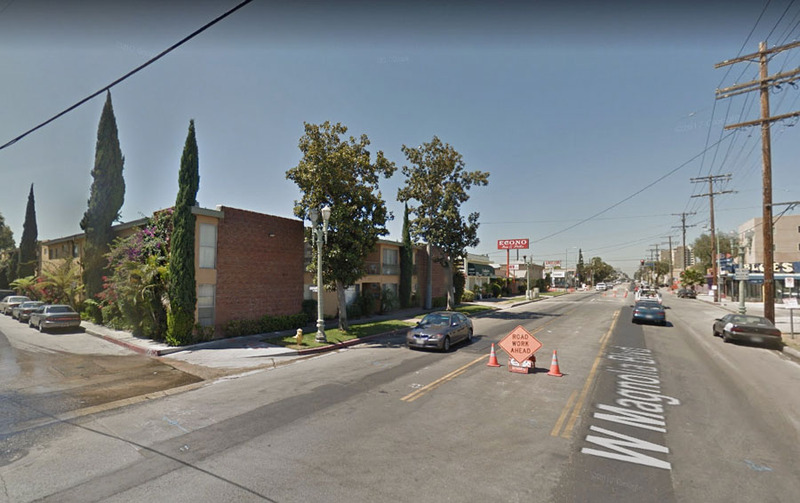 The City of Los Angeles Bureau of Engineering proposes to widen a 2,600-foot stretch of the northern side of Magnolia Boulevard between Cahuenga Boulevard and Vineland Avenue to improve traffic flow and reduce traffic congestion along this segment of the street. The proposed project would increase vehicular traffic safety by adding an east-bound through lane while maintaining a center turn lane. Meh? How does it increase vehicular traffic safety? What about the safety for all users, like people walking and biking? I would tell you to read the adjoining documents for yourself, but to save you the trouble, they say nothing of the sort. 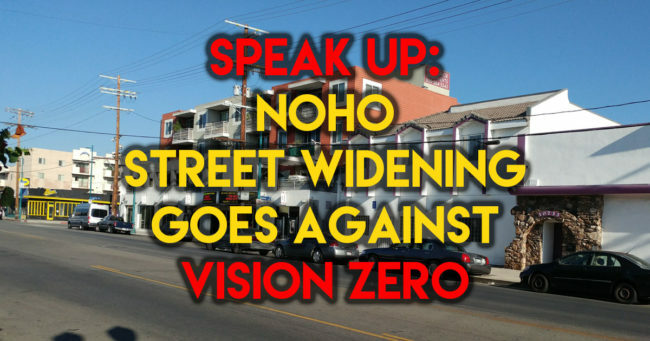 In 2015, Mayor Eric Garcetti claimed Los Angeles commitment to being a Vision Zero City by 2025, yet this offering goes against the very ideals of designing our streets for safety. First, if you’re unfamiliar with this project area, the distance from Vineland to Cahuenga is a half mile with only one controlled crossing (traffic signal) at the midway point at Riverton. The goal of this project is to improve traffic conditions for drivers, but looking at their studies, what is really the point? 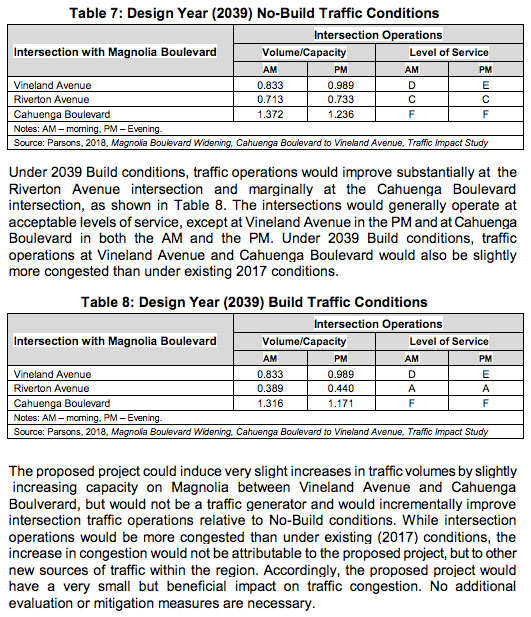 Even by their metrics, traffic will not improve at the major intersections of Vineland and Cahuenga whether this is built or not. The only difference is at the midway point of Riverton (which is actually only a three way intersection) where their study upgrades future service from a “C” to an “A” with these improvements. In other words, drivers can go faster and get to sit at the jams at Vineland and Cahuenga a few seconds earlier. 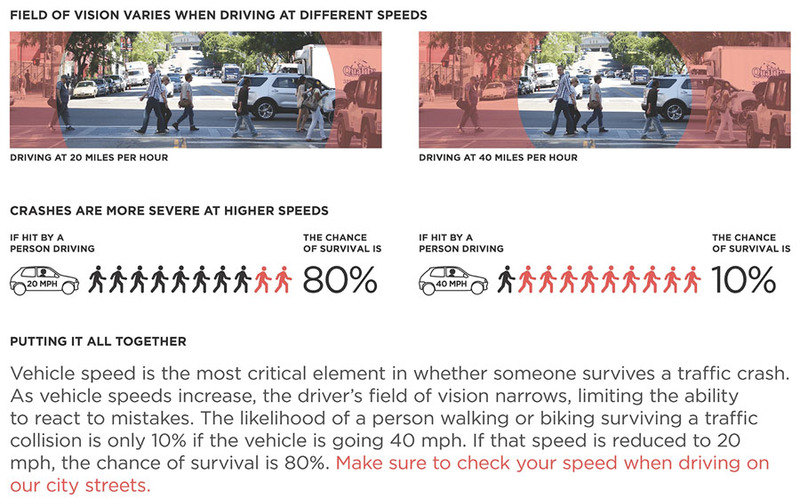 Isn’t encouraging higher speeds against Vision Zero? There is so much more that is problematic with this project that I can only go so far into detail, like using the outdated “Level of Service” metric to measure the street’s usefulness and cutting down sidewalks for an increasingly walkable neighborhood especially in front of the NoHo Senior Arts Colony. Please get the word out and share your opinions. This is a project that should not go forward in a 2018 Los Angeles. VIDEO: Which Highway 23 Descent is Dizzier?